Perennials, (15-)20-60(-70) cm (mat-forming), sometimes faintly aromatic (rhizomes creeping, relatively thin). Stems 1-3, erect or ascending, white, simple (stout), densely tomentose to floccose. Leaves basal and cauline (petiolate), silver-gray; blades oblanceolate, (proximalmost) 3-10 × 1-5 cm, pinnatifid (lobes relatively broad, rounded; distal leaves, on flowering stems, smaller), faces densely tomentose. Heads (erect or spreading, peduncles 0 or to 3 mm) in dense, paniculiform, racemiform, or spiciform arrays 8-20 × 2-4 cm. 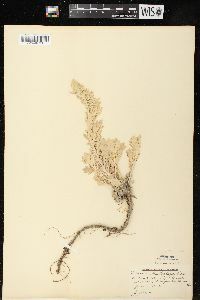 Involucres broadly campanulate, 5-8 × 6-7 mm. Phyllaries broadly lanceolate, tomentose. Florets: pistillate 12-16; bisexual 25-30; corollas yellow (narrow or tubular), 3.2-4 mm (unusually large), glabrous or sparsely hairy (style branches prominent, erect, blunt). Cypselae (dark brown) narrowly oblong-linear (slightly flattened, smooth), 3-4 mm, glabrous. 2n = 18. Flowering early spring-fall. Sandy soils, coastal strand; 0-200 m; St. Pierre and Miquelon; N.B., Nfld. and Labr. (Nfld. ), N.S., Ont., P.E.I., Que. ; Alaska, Conn., Del., Fla., La., Maine, Md., Mass., Mich., Minn., N.H., N.J., N.Y., N.C., Ohio, Pa., R.I., Vt., Va., Wash., W.Va., Wis.; n Europe; e Asia (Japan, Kamchatka). 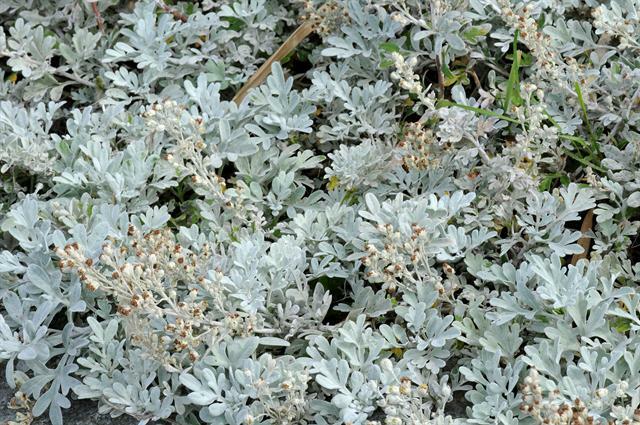 Artemisia stelleriana is apparently native along the western tip of the Aleutian islands (D. F. Murray, pers. comm.). It is an attractive ornamental and, in parts of its range in the flora area, it appears to have escaped from cultivation and is naturalized in beach dunes and other sandy habitats. Inodorous, rhizomatous perennial 3-7 dm, simple to the infl, densely white-tomentose or floccose; lvs 3-10 cm (petiole included) נ1-5 cm, with a few relatively broad, rounded lobes, which may be again slightly lobed; infl narrow and often dense; heads relatively large, the invol 6-7.5 mm; disk-cors 3.2-4.0 mm; achenes subterete, but narrowed at base and rounded above; 2n=18. Sandy beaches; native from Kamchatka to Japan, escaped from cult. and established from Que. to Va., and occasionally inland to Minn. May-Sept.